After graduation from the Louisville College of Dentistry, Edward Wallace Barr (1887-1962) joined his father’s practice in his home town of Bowling Green, Kentucky. 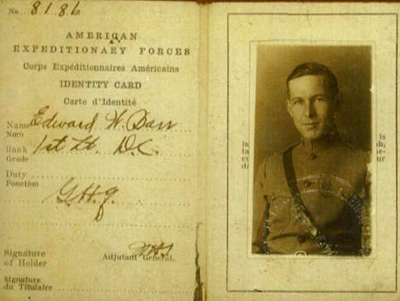 When the U.S. entered World War I, however, Barr was commissioned a lieutenant in the Army Dental Corps and sent to France. As a member of the Sixth Heavy Artillery, he was considered the first dentist to “go into the trenches,” but in November 1917 was put in charge of the dental offices at the general headquarters of the American Expeditionary Forces in Chaumont, France. There, his patients included Commanding General John J. “Black Jack” Pershing. As his appointment book showed, Dr. Barr treated many servicemen until his discharge early in 1919, but perhaps it was only General Pershing who merited a discussion between Barr and Pershing’s former dentist, Colonel Ross T. Oliver of the Chief Surgeon’s Office. “I am glad you found that upper bridge in good condition,” he wrote Barr. As to the gum disease affecting the General’s lower molars, “that condition has existed for a number of years.” His recall of one particularly troublesome tooth that had “such a loss of substance that we could easily run an instrument through the bifurcation” suggested, nevertheless, that Pershing could look forward to many more happy hours in the dentist’s chair. Records and correspondence relating to E. Wallace Barr’s service in the U.S. Army Dental Corps are part of the Manuscripts & Folklife Archives collections of WKU’s Department of Library Special Collections. Click here for a finding aid. For more collections about medical professionals, search TopSCHOLAR and KenCat.